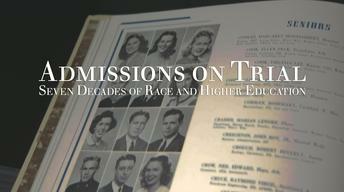 Admissions On Trial: Seven Decades of Race and Higher Ed looks at many universities, race helps determine who’s admitted. But a Supreme Court case could soon end that nationwide. We trace this issue from 1946 to today, and examine what race-blind admissions might look like. Activists, lawyers, university officials, students, and people who fought segregation discuss what diversity means, whether it matters, and how we should–and shouldn't–be able to seek it.